3D Bevel adds a dynamic bevel to a 3D After Effects layer, which reacts to an After Effects light source. It creates the effect that the layer's edges are illuminated by the light source. Move the light around, change the position and rotation of the layer and watch the bevel respond. In short, it's a very intuitive way to make your 2.5D layers feel a bit more 3D. 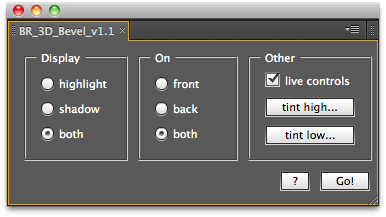 Optionally carry the script parameters over to the layer, keeping everything adjustable after the script has run.